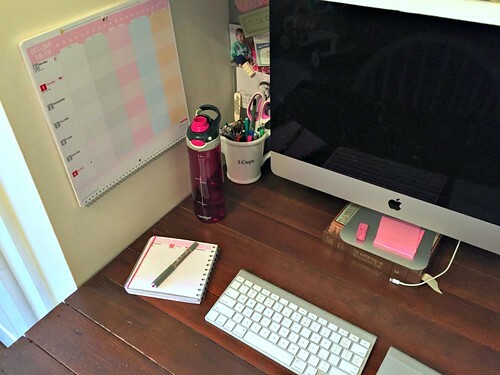 Back in November, I shared my new Calendar + Planner approach to the New Year. This was/is a brand new system for me as I’ve never used a wall calendar before, nor have I used TWO separate tools to stay organized. I honestly wasn’t exactly sure how well this Calendar + Planner system would (or wouldn’t) work for me, my family, my routine, etc. but I knew I wanted to give it a shot! Now, 3 months after using this system on a daily (sometimes hourly!) basis, I have a short list of pros and cons to share! I’ve used a Personal Planner for many, MANY years now — and I love that I can customize it to meet my needs each year. I have always ordered their A5 planner, but last fall, I decided I wanted/needed to try something new for 2019. With 3 different school schedules, church schedules, and various library and community activities going on every week, I had too many “other” things written in my planner that I didn’t have room for the things and to-do’s I wanted to tackle each day. I wanted a separate space for each family member so I could keep track of all the different things people were doing each day. 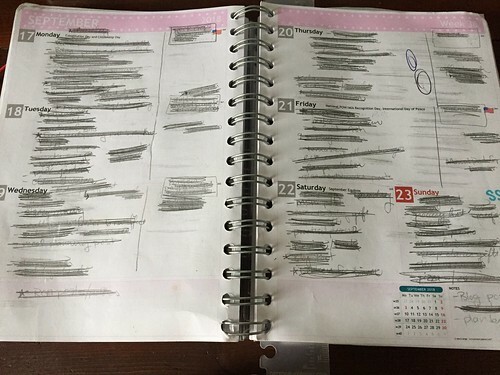 My thought process was that by using the Wall Calendar to clearly list each person’s individual responsibilities (and our weekly meal plans) I would free up tons of space in my planner — which I would then use exclusively for MY OWN to-dos. It’s probably still a little too early to know if this will (or will not) be the “perfect” system for our family — especially since our organizational needs will continue to change as the kids get older. However, now that I’ve been faithfully using my Calendar + Planner system for 3 months, I wanted to share a quick update, since so many of you have asked! The wall calendar is HUGE, with plenty of space for me to write everything everyone has going on each day. I have never run out of space once, and I don’t even write all that small! I also have SO much extra space in my own planner now, as it’s not “cluttered up” with everyone else’s to-dos and schedules. I have a spot for my menu plan. I’ve never really had a dedicated spot to write my meal plan in my planner, so I often just wrote it at the top of each day. However, now that I have the calendar, I use the very first column to write my breakfast AND dinner plans for each day of the week. This system has been extremely helpful for me as I can quickly glance at the calendar to see a full weeks worth of meals (I previously had to flip the pages in my planner to see a full week). My own planner is much more organized. Over the last few years, I’ve gotten into the habit of using my own planner as a daily to-do list — which works really well for me. However, with everyone else’s to-dos, meetings, appointments, etc. I was running out of space for my own things, and my planner was getting very messy and disorganized. This year, with the addition of the wall calendar, I’m back to using my planner for all MY various daily to-dos, many of which I transfer over from the wall calendar (more on this below). I love the smaller sized planner. I’ve faithfully used the A5 size planner for years, but now that I have fewer things to write in my planner, I absolutely LOVE the smaller square planner. I need to take the calendar off the wall to write on it. I didn’t think this would bother me, but I do not like taking the calendar off the wall every single time I need to write on it. I’m used to quickly flipping through the pages of my planner, so using the wall calendar requires an extra step — just something I need to get used to yet! The calendar weeks start on Monday instead of Sunday. This isn’t a huge deal for my planner (I like my planner to start on Monday) but I’d really rather have my wall calendar start on Sunday. I don’t know why this bothers me, but it has thrown me off more than once when I look at the wrong day because I assume the first row is for Sunday, even though it’s actually for Monday. Currently, this is not one of their customizable options (which is surprising) so I might email their customer service and ask it to be considered for next year’s calendars. I need to transfer information back and forth. Even before I started using 2 separate products to organize my life, I had a feeling it would be somewhat of a hassle to transfer things from the calendar to my planner… but I still wanted to give it a try! Now, 3 months later, I can say that I definitely do not love transferring my stuff over every week, but I know I’m still getting used to this new system. I forget things if I don’t transfer. Seriously, I never forget anything! So, I guess this is probably the biggest “con” for me because forgetfulness is definitely a huge pet-peeve of mine, and not something characteristic of me at all! Since I don’t want to forget any more events, activities, or appointment, my current routine is to write all our “upcoming” and “long term” events in the calendar first… and then transfer the upcoming week’s activities over to my planer every Saturday. If it’s a morning activity or appointment, I write it towards the top of the daily column in my planner; if it’s afternoon or evening activity, I write it towards the bottom of the daily column. It really doesn’t take me much time or energy to do this, and the act of re-writing is one more step in helping me remember. However, it IS one extra step that I didn’t need to do before. Honestly, I sort of wish Dave and I could find a digital system that worked well for both of us, for my business, for his school, and for our family… but the odds of that happening are slim to none! Dave actually creates his own customized planner for school (literally draws the boxes and makes photo copies) because he can’t find something that functions the way he wants it to for his classes… so between the 2 of us, we currently have 3 different planner/calendars. It’s not ideal, but it works for now. 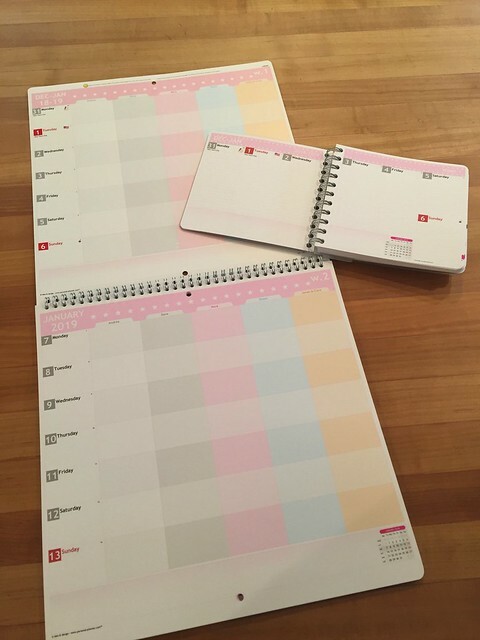 What type of planner / wall calendar / digital calendar / app do you use to keep yourself and your family organized? Could you do it the opposite way? 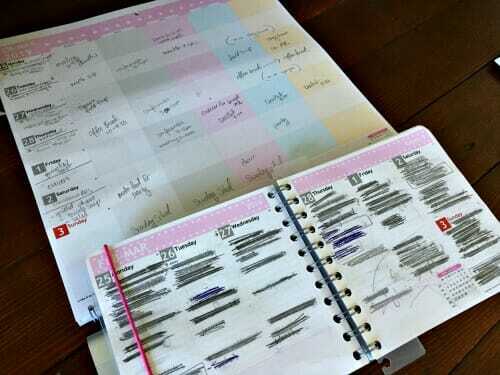 Write everything in your small planner as you schedule it, then transfer to the large calendar? That way, YOU definitely have the info (so you won’t forget things) and you could transfer things when’s you write down your meal plan, so it doesn’t feel like an “extra” step. You might even be able to transfer a whole month at a time (as long as you glance over the coming week (maybe when you make your meal plan) to make sure everything listed in your personal planned is there. I use a bullet journal which I love! It’s basically a spiral bound notebook, about the size of yours, and it holds ALL my lists for so many things! Then, my husband and I synced Google calendars which we access on our phone for events and appointments. It works nicely for us at this point. I just appreciate the patience you have in going back and forth these multiple calendars! I have used Google calendar -save an event as all day event and reminder set for previous day or week depending on the priority. I simply text the event if my husband participation is required for eg doctor’s visits, coz I know he reads text msgs more than shared calendar. I also use one note from Microsoft which syncs up to my laptop which is an added bonus. I use paper calendar for my work purpose only. That way I don’t get distracted with too many lists. I have a paper on my fridge for groceries- I simply write it down there when it gets over since we buy groceries weekly. Sometimes I take a snapshot on my phone and again text the list to husband if he is going. I don’t have an extra freezer or too many stored meals coz I know I forget and I have many many times had to throw away food since I forgot about it. So far this has worked for us . I might look for more options when they go to high school. You already know this because I tell you every time the topic comes up but I have to say going paperless is the best thing I ever did. All calendars are synced. Everything shows up on all devices plus on our echo show in the kitchen. What I haven’t shared is how I planned a three week cross country trip in a motorhome in an essentially internet free environment. Every camping reservation I made I got an email confirmation. I saved all of them on my iPad. As PDFs. I also printed each one and put it in a folder in a little cheap vinyl tote, just in case. I have a tiny wall calendar on the bathroom door (cork bulletin board put up by previous owner — it’s a true godsend, since when you are on the road you may forget where you are or what day it is LOL. I put the basics on it — check in, check out and abbreviation of park, like KOA AZ or HR CA. The best part was I only had one place things were written down. That was the calendar on the bathroom door exterior. All our maps and gps coordinates were saved on iPads. We took two plus each of us has iPhone and iWatch. Not a single lost piece of paper. Every important item like race tickets etc went in the tote. And each campground gave us a map so I put them with my reservations to remember if we liked a place or hated it. This was my first planning that was not purely electronic. But all the rest of the 21 days menus were on my iPad and every time I ran out of something I added it to AnyList app right then and there. I used my list to restock my coach. I also discovered that three weeks requires 8 rolls of TP 4 liters of milk two cubes of butter and approximately 100 paper plates. I honestly could not have managed all this without my devices. Oh and we did not have a working pen in the bus LOL. 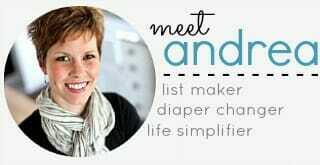 Andrea: instead of going to a smaller planner, couldn’t you go a larger one and then go back to putting everything in one place? I’m a big fan of keeping everything in one place so there’s no copying back and forth. That said, I do keep a wall calendar to keep track of appointments so my husband can’t tell me he doesn’t know about something…in spite of me telling him multiple times. I keep the wall calendar on the wall as we enter and leave the bathroom. Since my husband can’t claim to not use the bathroom, there’s no longer any question of him not knowing about something. It may have taken me 25 years to come up with a system that works, but this has been working for us for five years now. That said, my kids are already getting to the point where they want to know what’s going on, what’s for dinner, etc. so I suspect some sort of family wall calendar will be in our future (maybe something I can mount in the kitchen or mudroom?? I’ve tried the wall planner like you do know, but could not continue. I now function with an A4 year planner on which I literally colour block/frame/highlight “big” events like school holidays, my husbands big sports events, his hunts and our family weekends/holidays. In my Moleskine Weekly Notebook & Planner, I divide the weekly side in two columns – one for the kids activities, and one for my appointments/duties etc. The right hand page are divided into DO, BUY. and sometimes OTHER. That includes shopping, things to deliver or remember,appointments to make, etc, plu this week’s birthdays in the upper right corner. My kids are in their own colour pen, my husband’ flight times in red, and the rest in pencil. I’m planning to add a weekly layout a la Ryder’s BuJo by simply sticking a (downloadable) empty Moleskine page into the beginning of each month (their is a monthly calendar page to the front of the book, but I want to try the listed method. wow, that sounds like a fantastically organized system! Love it! Have you tried Cozi? It’s digital and it’s the only one I’ve found worked for my family. I still went back to my paper planner because I’m old school, but it syncs between all your devices and you can have unique calendars for each person/event etc. you are one of MANY people to suggest Cozi today! I tried it many many years ago (before kids and smart phones) and it wasn’t super helpful for me. But it might work better now. I’ll have to look into this. 1. 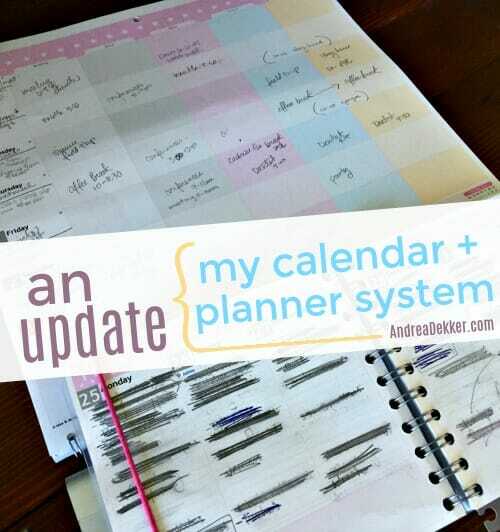 Personal Planner – this is my #1 tool in scheduling appointments and because everyone’s appointments affect me (I drive the kids places, or I need to babysit the other if my husband helps), everything gets scheduled here. I use the weekly page (daily slots) mainly as a journal (notes when someone gets sick, someone said/did something worth reading about in a few years). 2. Wall calendar. I actually cut off the pages and post, one page at a time, on the fridge with magnets. The first day of the month I transfer appointments from my planner over to the wall calendar, using different color fine sharpie, for different people (red for the entire family). This is mainly for everyone to be able to see what’s coming up. I do have to add info towards the end of the month, but only 2-4 times and I can write on it where it is. No big deal. 4. 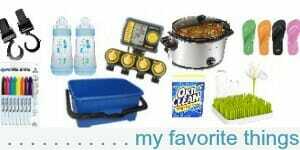 Shopping list – I have a master list with items I usually buy (by layout of the store – thanks to you!!) I highlight what I need to buy that week and hand write any special items. Natalia – I have to say we might be twins! That’s exactly how I handle my planning, too. My husband and I do use Cozi for things we both need to know about – however the bulk of “my” stuff and the kids’ stuff happens during times when he’s at work and I’m on my own to handle it anyway. Dentist appointments, specialists, etc are in Cozi as well as the fridge calendar and my planner… if I go under the bus, he will know where and when to be. Hi Alice! I love knowing that I have a twin out there, somewhere in the world, doing life like I am 🙂 I didn’t know about Cozi until just now and I HAD to look it up. It looks like a great tool. The rest of my family is not very digital (for now, at least), but it might be a good idea for the future. Thanks for mentioning it! yay for the Personal Planner! I still love mine too!! I honestly wish I could be an electronic planner person, but so far, I just can’t find an online/digital system that works for me. I NEED to be able to cross things off! I suspect you may always be that way, Andrea. I have to write things down, be able to cross them off/check them off, and see a physical layout. When I worked at a desk all day and could see my Outlook calendar on a huge monitor – electronic worked for me. Now we use Cozi (which imports into my husband’s calendar) for things we both HAVE to know about about and the rest is just in my planner. I get mocked all. the. time for this… but paper just works better for me! yes, I remember best when I write things down. In college, my best method of studying was simply to copy and re-copy my notes the week leading up to exams! I am one that now uses my iphone for everything. When I add to my calendar it automatically adds it to my hubby’s phone also. I also make a paper calendar that stays on our breakfast bar and is good for 4 weeks. My hubby had an accident and has brain damage so this helps him immensely. I draw six lines on both sides of a piece of printer paper going the long way across. This gives me 7 days to write appointments on. I then fold it in half and write the date on each of the seven days, open the paper for the next 2 weeks and then close to the back for the 4th week. It took me a few years to come up with this plan but it works. This calendar also has meal plan on it so he can see what is on the agenda. I made up a template that I just print near the end of the 3rd week and start getting the new one ready. I do keep my to do lists, grocery lists and meal plans on my phone too. I find it very convenient as I always have my phone with me. What app do you use on your phone for a calendar and meal planning and groceries? Hi Juli, I just use the calendar that came on my iPhone. I also use the Notes App for my to do lists, grocery list and meal plan. They are not all together but in the Notes App. The meal plan goes on the paper one I put on our breakfast bar too. I find I use my phone for a lot more things all the time. This from a person who a few years ago couldn’t see any reason to even have internet. I can’t do transferring info. I don’t have time for that. We have 2 whiteboard calendars in the kitchen. One for present month and one for next month. There is space on the bottom for additional notes. Each family member has their own marker color. If it’s a family activity or bday it is written in black otherwise it is written in the family members designated color. I can see this month and next month with a quick glance. I take a picture of it on my phone at the end of the month before it’s errased. Every sees it everyday. It’s a lifesaver for 2 working parents with 3 kids. I use a large white board calendar from Walmart for keeping track of everyone’s appointments, church events, nursery duties, Dr appts, basketball games and practices, etc. It’s centrally located in my kitchen where I see it throughout the day to remind me of what’s going on (out of sight is out of mind for me!). At the end of the month, I transfer all information from the whiteboard into my 8 x 10 BlueSky planner on the full month layout and erase my white board to start a new month. Then I use the weekly spread (7 days layout on 2 pages where I can see everything that week) in my planner to write meals, to do lists each day, and if someone is sick it becomes my meds tracker so I don’t overdose anyone! I also use sticky notes to keep lists and stick them in my planner so if I don’t finish up that week on my todos I just move my sticky notes to the next week. I don’t think I could use a smaller planner than the 8 x 10. I fill it up too fast plus I like that I can keep it open on my counter in the kitchen to the weekly spread. I’m constantly writing and checking things off throughout the day. I really want to be a planner-girl , but planners just do not seem to work for me. But I certainly have lots of calendars. 1. My husband and I share Google calendars to keep us on track (most of the time – sometimes I forget to check it). When we make appointments, see events of interest, it’s easy to check Google and add the item. One color for birthdays, my husband has a color and I have a color. This works very well for us. But I also have a paper birthday calendar that I keep in a visible place. I have a menu planner (2 weeks worth but not dated just days of the week) that I keep on the fridge. I will also add important reminders there because we go to the fridge every day. I have a small calendar where I track health related issues (I have a few of those). I used to have a large desk calendar for us to write what happened that day and then I would transfer to an engagement calendar monthly. This year we are skipping the desk calendar part and just writing directly in the engagement calendar. I have been keeping an engagement calendar for over 25 years. Not as a “planner” but as historical record. I like the spiral ones by Sierra. Since getting married, at the end of every year I will type a list of the important things that happened that year and I keep it in a 3 ring binder. This may have been inspired by Andrea’s binder posts. I have one list that is a running list of the years and another that I group by headings. 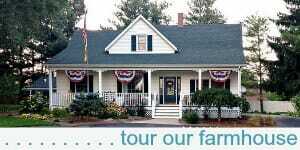 Each vehicle, the house, family etc. So I can quickly look and see when we bought that computer/refrigerator/new roof/tires etc. That does take a little effort, but it is so handy to be able to have that information at my fingertips when it’s needed. It’s just the 2 of us. I’m not sure i could keep up with the schedules for 6 people. My hat is off to all of you who do that on a daily basis. I use an ~9×12″ paper planner with monthly/weekly views. I really only use the week layout though. I’m also the schedule keeper for the two kids (6&4 y/o). My husband is like Dave, he makes his own paper calendar. On Sunday evenings we review the week ahead, which ensures we both know what is going on that week. We also review the upcoming months (near the end of each month), informing each other of events. Right now it works for us! The only drawback is that my paper calendar is large. I like to carry it with me all the time; thus, I have tote bags or larger purses for everyday… which leaves me plenty of room for my current book! 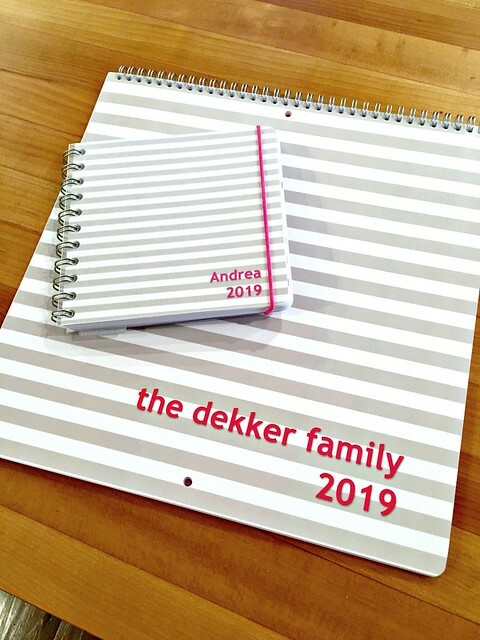 Andrea – I’m in the process of trying to create a website that allows the visitor to create their own customized planner page which is then converted to a PDF for easy at home printing. If you are comfortable sharing the page Dave creates, I would love to try and recreate it as a beta test. oh my — Dave’s “planner” is literally just notebook paper with some lines drawn to make a column for each class per week. It’s SO super basic, I don’t think anyone would ever want anything like it! I use a wall calendar, too, but I usually just choose a pretty one for my office and a cute one for the boys room, not spending much on them. They mostly serve as a quick glance to find out dates (I write birthdays and other main events) and to help the boys learn days/months. I’m sure when they’re older and have outside activities we’ll do something different. Just 2 days ago I had a dr appt and took my paper calendar with me to be able to verify who had the day off to take me for a followup appt and the dr said to me, ‘You know, they make digital ones of those”. I laughed and told my daughter she would have to show me how to set it up on my phone. But I really do like a hand held paper planner. (I am convalescing after a rolled ankle resulted in a right fractured ankle) I love your blog and pass it along to others often. Andrea, I took your suggestion to try out the Personal Planner. I am a pen and paper type of person. I got the size you have been using prior to this year. I spent a long time deciding on the layout, but did vertical columns for the days. The top part is blank, and I write appointments/plans there. The bottom section of each day is lined, so I write specific to-do’s there (and I cross them off when completed). There is one small section where I do just the supper plan for M-F, and that is sufficient for me. I have to say thank you, Andrea, for explaining about your planner in such detail, and telling us about Personal Planner. I love mine! It is working out great for me/our family! this sounds very similar to how I set my planner up for the last several years — I loved that set up and glad you do too! I can’t quite see how the wall calendar is laid out. Do the weeks on that wall calendar go vertically? That would be a no go for me. I don’t use a personal planner at all, but I use a wall calendar ALL the time for work and I could never get used to the vertical weeks. Also, couldn’t do a Monday start–that would throw me off, too. I use Google calendar, which can be customized pretty easily, for work–after MANY year of using Outlook–and I love it. We share events digitally and it works great. I would NEVER transfer info either so I can totally see that as a HUGE downside. To me, that kinda defeats the purpose. We have friends who have successfully used iCal for years–right down to the menu plan, that mom inputs every month so everyone can see what’s for dinner. I am always amazed by their organization and effective communication. I despise transferring info all the time. What works best for me is keeping a shared Google calendar for our family (just my husband and I use it as our kids are still young). We add appointments to it as we find out about them (for example, at the doctor’s office I put the appt in Google cal instead of taking an appt card). We each can see schedule changes in real time which prevents us from double booking. It’s also very easy to set up recurring events (work every Monday 8-5, Bible study every Wednesday 7-8, etc). I have a separate Google cal that we share that tracks our childcare since it is a hodgepodge of a few different people. I have another Google calendar with important birthdays and anniversaries set up in it as recurring events. Then for myself, every weekend I map out the basic backbone of our week (who goes where and when) in my planner and fill in my to dos around those things. Perhaps you guys could try a Google calendar, but Dave could keep his school stuff separate on paper. You could even print off the week view of a Google calendar each week and post it somewhere for all of you to see. Yes! My husband and I do a shared Google calendar that’s on our generic iPhone calendar app. It’s essential to our lives with 3 kids and their sports schedules and appointments. My work day ends at 2:30 so anything outside of that goes in that calendar so he knows what we’re are up to, if we will be home for dinner, etc. Plus he can tell if we have plans with friends, family get togethers, etc without us having a special “meeting” about it. wow, that is confusing, i hope you work out the kinks soon. how do you keep track of a day when each person has their own column? that’s the one thing i’m curious about! maybe it’s different cause your kids are in traditional school? cause what happens if you schedule a appt for one kid not realizing that there’s a conflicting event with another? I too use the Google calendar for long term planning (and instant entry on the go). Daily, I use a bullet journal so the method of planning (long term/monthly/daily) can and has changed with my needs. I do sit down once a month to transfer from Google into my planner and to a wet erase calendar that hangs in our kitchen. Have you tried using the Cozi calendar? It is color coded and can be used on phones and your computer. I use Cozi for our family and love it. Each person has their own color. I put my to do items as all day events for me and they are grouped together for only me to use. I put a blank space before my menu planning meal and it is always at the top of each day. Each member of my family had the Cozi app on their phone or can access from the web so they can easily look at what event they have or what we are having for dinner. It also has a feed for calendars from the web which has come in handy for high school sports schedules. I highly recommend it. We use Cozi as well. We all have it on our phones and get reminders of upcoming events. Plus I use the meal plan feature, and use it for all my grocery lists. I love it and it’s worth every penny of the $30 per year charge for the premium version. We use Cozi as well, the free version. We were running into the issue where my kids were getting older and had more activities. My husband wanted to have an idea of what was going on when so we tried the free Cozi version. We’ve had it for a couple years now and it’s worked out really well. We can both access it from our phones and I like that I also have the availability to use it on my desktop. not for many years, maybe I should try it again now that smart phones are a thing! I use a similar system, but instead of a wall calendar, I use a google calendar that I share with my husband and two oldest children . My work google calendar also integrates into it. I find it so easy to quickly add appointments when we are out and about and my kids like seeing what our week looks like. I then still sit down every Sunday to transfer important appointments to my planner. I do this so I can have all of my to-do’s, appointments and meal plan visually laid out. It allows me to account for drive time and include things like ‘bring form’ etc. to appointments. It took a bit of an adjustment to shift to digital, but I love it now, especially with crazy kid schedules! Many of my children’s activities/sports offer a link to their schedules, so those auto populate into my google calendar… saves me tons of time! The transferring is what kills planner use for me every single time. 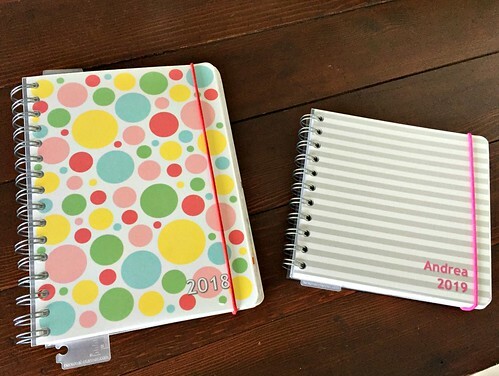 I would love to use a planner as it’s so much more convenient when on the go. However, since I’m in charge of everyone’s schedule, not just mine, I was transferring things all the time. Then if I forgot to transfer things or didn’t look in the right spot, I’d forget. I’m back to only calendar now. I still have my nice planner that I got on clearance that I may use eventually but for this season, a wall calendar that everyone can look at is working for us! My husband and I use Google Calendars. I’ve tried to use paper planners, but it just doesn’t work for us. I have a lot of Google Calendars. My husband and I have a shared calendar for our joint events and kids events (our kids are only 1, 3, and 5 so there aren’t a lot of kid events right now). We then each have a separate calendar. Those calendars are all shared so we can both see them at all times. I then have a Goggle Calendar for each of my jobs. I create a to do list as an all day entry and then move it from one day to the next, deleting items as I complete them – if that makes sense. My job calendars are not shared with my husband. This works best for us as we’re both able to see the other persons calendars on all of our devices. Oooh, a list as an all day event that you move, that is genius! Borrowing that idea! This sounds very similar to what I do, including putting my to-do list on my calendar. I used paper planners for years all through high school and college, but once I discovered Google Calendar I ditched the paper planners altogether. I still use a large wall calendar so that my husband and kids can see the big events coming up, and transferring is a bit of a pain, but I love having everything synced to my phone and online since I work from home on my computer. PS – Just realized both of these replies are from people named Laura…but we are different Lauras! Haha! I like the idea of a large wall calendar, but I can’t keep up with transferring. My kids are too young to read and my husband syncs with my calendar, so I guess I can put it off for awhile. i have been waiting for this post to see how you got on. Transferring info is a nightmare for me.. i get appointments in the wrong days, wrong times and miss them completely..
haha — I’m sure I’ll do another update at the end of the year!